Instructions: Click here to view a larger photo of this project. Box size: 3 1/4" square. Box template found here. Cut out and put box together as directed on tutorial using blue card stock. Cut panels for each side of box also for sides and top of lid from decorative paper. Cut 3 Eyelet Lace Frames, use 1 for the corners (sides of box) and 2 for the lid sides from white card stock. Cut 4 corners from the Album Tags and Accents Die from white card stock for the 4 corners of the top of the lid. Cut 8 borders from Album Tags and Accents Die out of white for each corner of each side. Stamp, color and die cut several sets of each size flower using Tiger Lily and Magenta Hue (Sponged colors are the Brilliance inks). 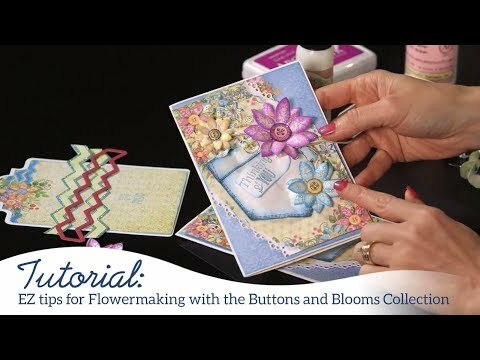 Shape flowers and glue 2 to 3 layers together then add a threaded button to the center of each flower. Glitter each flower by sponging on glue and sprinkling with Rajni's Crystal Clear. Glue one medium sized flower to each side (make sure that it does not interfere with the lid). Glue 3 to 4 flowers on the lid top. 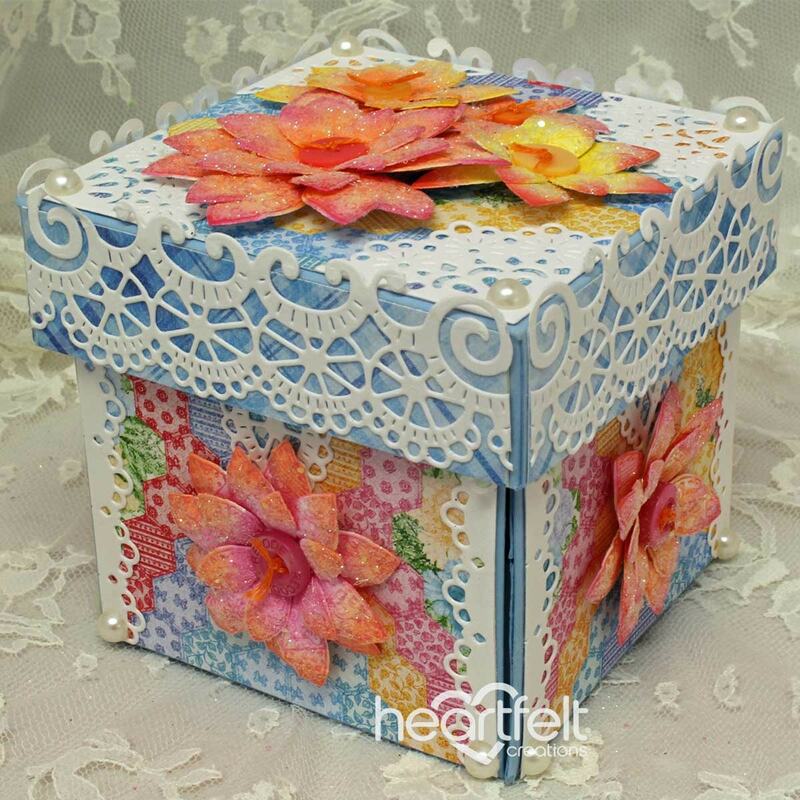 Cut a sentiment from decorative paper and glue it to one of the box layers inside. Add small pearls to the corners of each side at the top and medium sized pearls to the bottom of each side also to each corner of the box lid top.